As far as download numbers are concerned, the Consumer Preview of Microsoft’s upcoming Windows 8 has gone down pretty well – building on the popularity of the early Alpha release with over a million downloads in its 24 hours. As PC users digest some of the newer features clustered into the much-discussed Metro interface, not everybody has been too chuffed to see the demise of the traditional Start Menu – a prominent Windows feature since its commercial inception. Luckily, those wishing to be reunited with the usual Start Orb or Menu can do so without, of course, reverting back to an older OS. 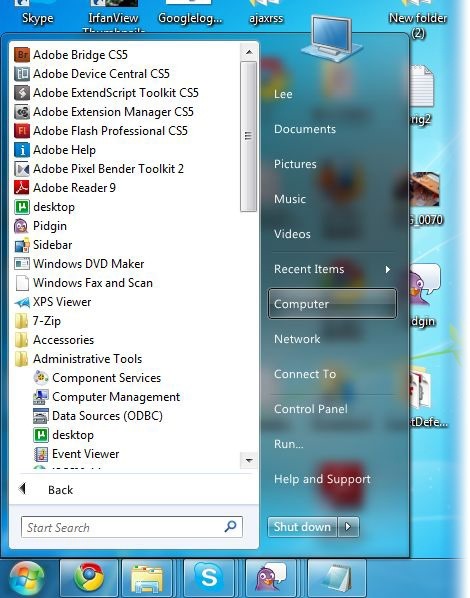 A developer by the name of Lee Matthew Chantrey has provided the solution – a small, effective little application named ViStart, which was initially created to allow Windows XP users to enjoy a Windows Vista/7 style Start Menu. Please note, if you do go ahead and install ViStart, you will be offered third-party programs (Babylon toolbar and Registry Cleaner Pro) during the install process which you probably won’t want cluttering up your installed items list. The app itself is as simple a tool as you could possibly get – just install, and your Start Button (or Orb) makes a dramatic, heroic return. The trouble is, since the new button overlaps with the Taskbar, you have to put an extra shift in to get things looking completely smooth. To solve this problem, simply create a new blank toolbar on the Taskbar, which will in turn shift the other icons across – giving a uniformed finish. Of course, once you implement ViStart, Windows 8 will look and feel much like the Redmond-based company’s current Windows 7. Then again, that’s not worth moping about, since 7 is arguably the cleanest-looking iterations of Windows pre version 8.The Metro-tiled Windows 8 has generally been met with positive reviews, and although some are afraid of change, the way in which Microsoft restored faith in consumers post Vista suggests we should wait patiently and see what the final product delivers. After all, strong integration with console and mobile devices will be playing a key part, thus it will be interesting to see if the "in sync" state of play works out for Microsoft as it has done for rivals Apple.